Today’s consumers are on the go, and digital billboards allow you to reach them on their daily commute. Messages can be targeted to specific demographics, times and locations. Live-stream information: We’ll utilize RSS feeds to keep up-to-date scoreboards and social media updates. On-the-fly changes can be made to your digital ads as you react to audience response. At iDigital, we’re digital natives with our fingers on the pulse of consumer action in the digital age. Today’s constant barrage of data makes people weary; they can’t process all the information they are asked to consume. While we’re advertising experts, we also live in a media-saturated world ourselves. This experience has helped us understand that sometimes less is more, and when and where you speak, affect your message far more than how loud you speak it. In the course of a hectic, information-laden day, there are certain times, or touchpoints, when people are most open to influence. Surprisingly, it’s no longer while they are relaxing in front of the television during the evening. In fact, while they’re parked in front of the TV, their computers and cell phones are likely next to them, all vying for their attention. Consumers, it turns out, are less distracted outside the home than inside. Cocooned within their cars, commuters are least likely to be sidetracked by their mobile phones. Music is what helps them relax on the drive, making radio advertising simple background noise. In addition, traditional advertising mediums, like local television or radio stations, are falling out of favor with consumers who prefer ad-free satellite radio options like Pandora or Spotify, the streaming media and video-on-demand convenience of Netflix, or the option to sidestep commercials with their DVRs. It’s possible to spend millions of dollars on advertisements that your targeted audience will never see or hear. 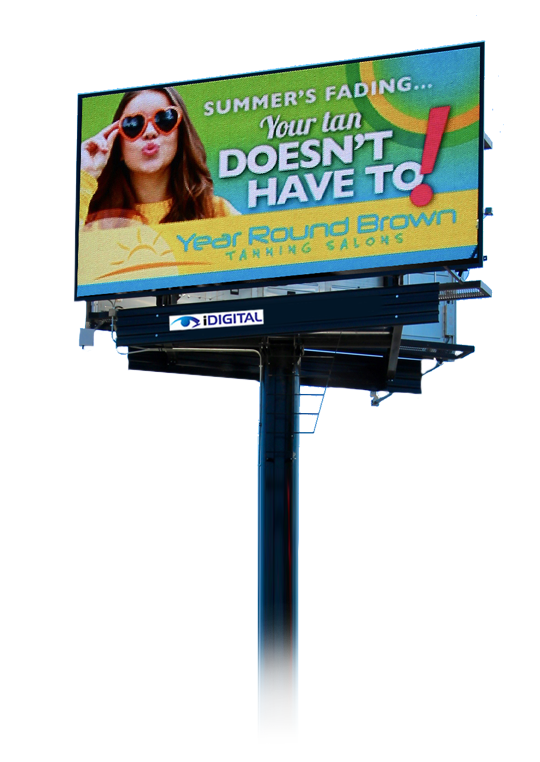 Outdoor Digital Advertising offers you the chance to reach these customers where they cannot bypass your communications. Your ads will find them when they are the least distracted, and therefore most receptive to your message. iDigital is here to take full advantage of this window of opportunity. In a Neilson study, seventy-one percent of respondents said “ads on digital billboards stand out more than ads online,” and nearly half felt the same when comparing digital billboards to TV ads. We believe that we are the perfect complement to traditional marketing platforms. You need to make the most of your advertising dollars. At iDigital, our innovative team will help you integrate outdoor digital advertising into your existing campaign, and take full advantage of your message by reinforcing strong brand awareness and by cultivating a loyal fan base. Short, frequent, real-time digital billboard messages can extend the life of your TV advertising and aid in recall. The greatest indicator to us that digital billboard messaging pairs great with radio advertising campaigns is the fact that radio stations are some of our biggest clients. Sight and sound are the perfect duo, plus, billboards help you reach digital radio users. Older consumers tend to have more money and watch it more closely than millennials do. They’re also more likely to read traditional newspapers and magazines. A print coupon can be tied to a digital billboard message to resonate with your wealthiest customers. In the digital information age, not all people check their mailboxes or are overwhelmed by the messages in their inboxes, so they may not be aware of your direct mailing information. In seconds, a digital billboard can alert them to it. For more information, contact iDigital today! We’ll guide you along the way and make ourselves available to answer your questions. Monday-Friday 8-5 or by apt.